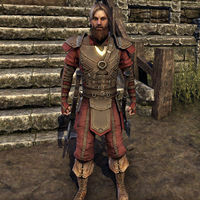 Constable Leonce Gavendien is a Breton and the leader of the Bitterhand Bandits, the local brigand gang in the region of Rivenspire. He can be found in the town of Fell's Run, where he managed to usurp the position of the captain of the guard in the goal of committing an heist on the local jewelry. Frightened Folk: Help a former constable investigate her suspicious replacement. Fell's Justice: Retrieve the stolen jewels and restore order to Fell's Run. "Ah! A stranger in town. I was just saying how we needed more strangers around here. You know, walking around, bothering people who are just trying to do an honest day's work." "Is that the kind of stranger you are, friend?" Are you saying that I'm bothering you? "No. No. Not at all. Of course not. You're as welcome here as anyone else … unless you cause some kind of trouble." "There's a new constable in town, and some things are going to change. That's all I'm saying. I'll be watching you, friend." This page was last modified on 18 September 2018, at 01:58.